Narda 777-40. Fixed Coaxial Attenuator. DC to 12.4 GHz. 40 dB, 2 Watts. Type N (M-F). Sorry, no local pick-up for this item. SMA (male) - SMA (female). C to 125 deg. 40 dB Attenuation. 50 ohm characteristic impedance. Average power input: 10 W, Max. Weinschel WA40-40-12. 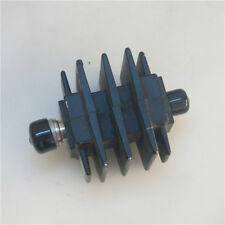 Coaxial Attenuator. 40 dB, SMA (M-F). DC to 3.0 GHz, 150 Watts. Microlab / FXR AB-40N. Fixed Coaxial Attenuator. DC to 4.5 GHz, 40 dB. 50 ohm, 2 Watt. 1.25:1 VSWR, Type N (M-F). Maury Microwave US255F 28 to 32 GHz, 40 dB, Waeguide "Mismatch" Attenuator, New! Maury Microwave US255F. 28 to 32 GHz, 40 dB, Waeguide "Mismatch" Attenuator. United Kingdom. Conditiion: NEW. Rate (item arrived). United States. United Kingdom. Conditiion: USED, GOOD PERFORMANCE. Rate (item arrived). United States. 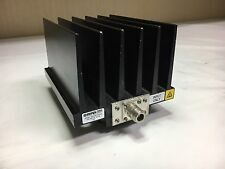 Bird Technologies - Attenuator, 40dB, 300W, 2.4GHz. Attenuator Operation: Uni-directional, See Drawings for dB Standard Values. Impedance: 50 ohms, nominal. Weight: 12 lbs. Condition: Used, good performance. Rate (item arrived). Condition: Used,good. Rate (item arrived). Conditiion: USED, GOOD PERFORMANCE. Rate (item arrived). This international order may take longer to arrive. Local pick up is not available. Conditiion: Used,Good. Rate (item arrived). Rate (item arrived). United Kingdom. United States. Condition: Used,good. Rate (item arrived). United Kingdom. United States.